Great building, very clean room, excellent and attentive hosts. No need for keys as both building door and apartment door open with the same code. We stayed in many apartments in many different cities but I think this was one of the best that we ever stayed in. Will definitely stay here if I go back to Edinburgh. It was the easiest in/out of all our stays on the trip. Everything went smoothly and as expected, which made it easy to come in and relax after touring all day. Lots of space and great amenities. Very close to tram line making it easy to travel around the city. Room 6 was spotless, great, fantastic. A great little studio and a lovely view out the windows. The bathroom and shower were great. Love that the hand soap is a liquid jar so the little soaps are not wasted. The kitchen was great as well. I will book again on my next trip. The team was very responsive by email. Haymarket apt is very, very close to the Haymarket metro station and the A100 bus line to the airport. Just a perfect spot - 15 minute walk to the Castle. Close to train station. Great for sight seeing! Friendly and accommodating hosts. From the very beginning the communication was great, nothing was too much trouble. Fantastic apartment with quality furniture and fittings combined with an attention to detail. The location was excellent for us. Fantastic location for attending a conference at the EICC. Beautiful property, just lovely and convenient. Fabulous fabulous fabulous! Great communication, access was super easy, beautifully decorated and furnished and the location was perfect for us, 2 minutes from a tram stop then less than 5 minutes to the centre. Easy walk from Haymarket Train Station. GREAT patisserie cafe opposite for breakfast (shout out to Noir) super comfy bed and sofa bed, bathroom was great too. Highly recommend the King Suite. Loved the entire apartment concept. And especially having a code to get in and not dealing with keys. Apartment was very spacious and all our needs were met. Beds were comfortable and the bathroom very nice. Spacious room with tasteful decor. Beautiful bath facilities that were very well designed including heated towel racks. Compact kitchen area that has microwave and a small cooktop. Nespresso machine was a nice touch. Lock in a great price for Haymarket Apartments – rated 9.3 by recent guests! Haymarket Apartments This rating is a reflection of how the property compares to the industry standard when it comes to price, facilities and services available. It's based on a self-evaluation by the property. Use this rating to help choose your stay! 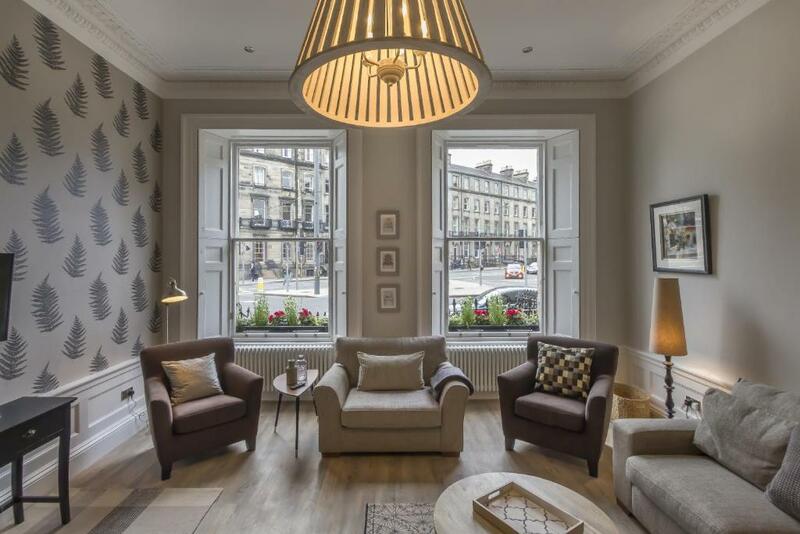 One of our top picks in Edinburgh.Set in Edinburgh, Haymarket Apartments offers free WiFi and city views, a 4-minute walk from EICC. Each apartment comes with a fully equipped kitchenette with a microwave, toaster and coffee machine. A seating area with a sofa, a flat-screen TV and a private bathroom with shower and free toiletries are also provided. Edinburgh Castle is an 11-minute walk from the apartment, while Royal Mile is a 16-minute walk from the property. The nearest airport is Edinburgh Airport, 5.6 mi from Haymarket Apartments. 뀐 Located in the top-rated area in Edinburgh, this property has an excellent location score of 9.3! When would you like to stay at Haymarket Apartments? This twin room has soundproofing and kitchenware. The largest and most luxurious suite at the property. There is a separate bedroom and living room area, with 3 HD flat-screen TVs, with one placed in the bathroom. This suite features a view, electric kettle and stovetop. This suite features a electric kettle, sofa and stovetop. This suite has a dining area, electric kettle and stovetop. This suite features a view, toaster and electric kettle. This twin room has an electric kettle, soundproofing and kitchenware. All guests can check in any time after 2:00pm. We do not have a reception, so guests can easily check themselves in, by following instructions sent to their E-mail. A hassle free, and quick way to get access to your apartment! We are a small family run business, who pride ourselves on giving every guest a memorable lovely stay. 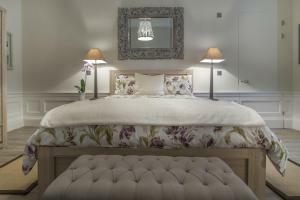 Each room has been individually decorated with the utmost care and attention to detail. 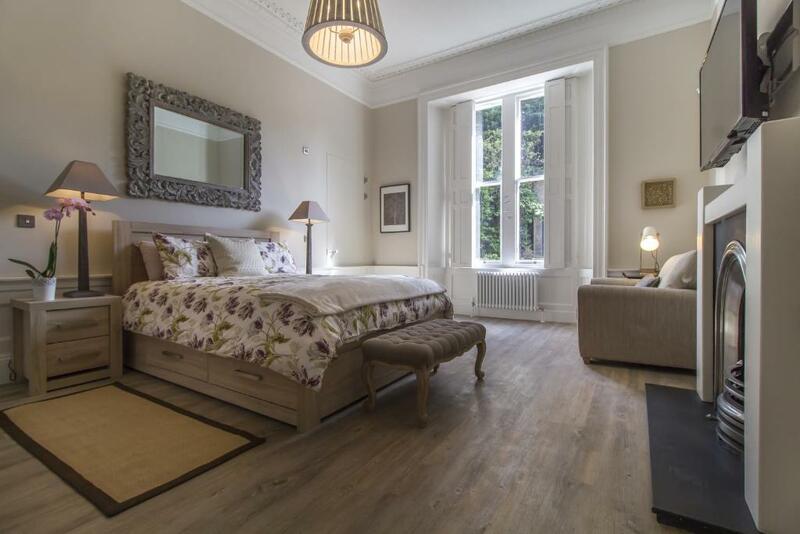 This Period Building is full of character and charm and has been completely restored to the highest standard, and by staying at Haymarket Apartments you get the best of both worlds - gorgeous Georgian detail with unique contemporary furnishings. 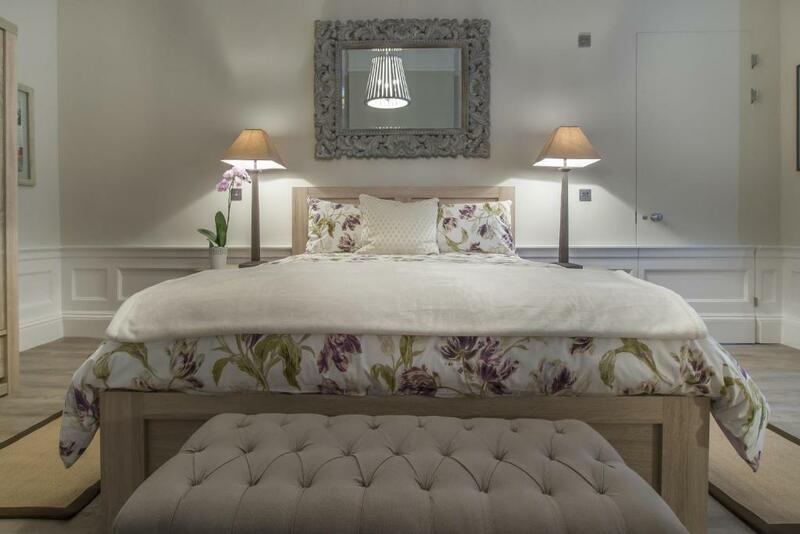 Our mattresses are of the highest quality, ensuring you get a great nights sleep, our bathrooms are not only very spacious but are fully kitted out with porcelanosa sanitary ware, the leading edge in bathrooms. Our kitchenettes are equipped with all necessary cooking equipment, as well as an Nespresso machine for every room to enjoy. We really hope that by staying with us you have now found a place that you want to come to again, and again. 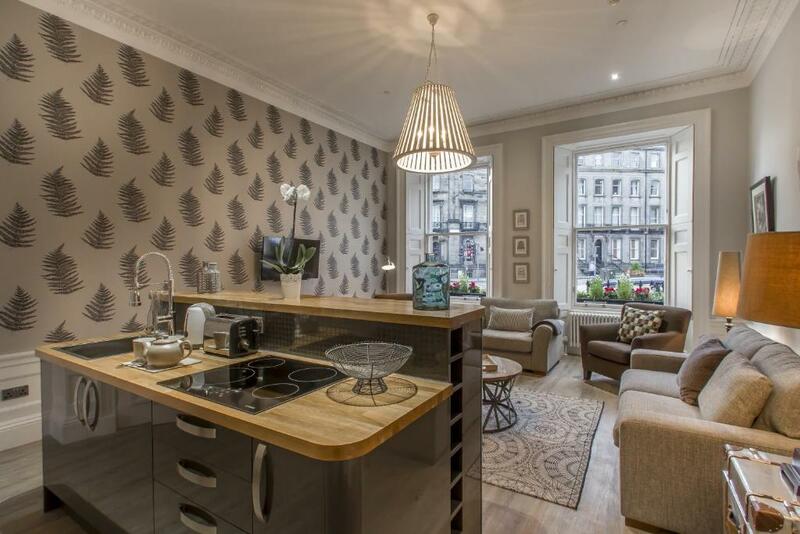 Haymarket Apartments are situated in Edinburgh's Bohemian West-End. The area is full of funky little shops and one off cafes, restaurants and bars. 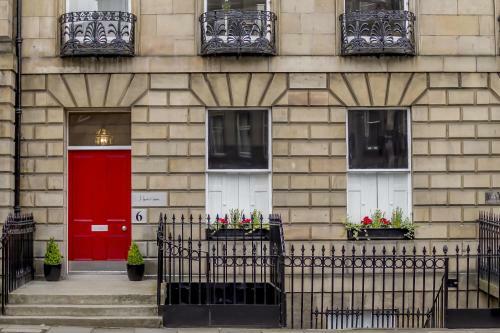 Within a short walk the neighbourhood also offers some of the must haves for any good stay - including; a pharmacy, grocery shops, train station, best croissant and pastries in the west end as well as an amazing sandwich bar just down the road. Each room comes with a neighbourhood map that we have personally put together that highlights some of our favourite places. The Haymarket area is so close to many of Edinburgh's star attractions that you can walk or take a short bus, tram ride too. The area has a great city vibe, full of life and variety, two things that make this city a great destination. House Rules Haymarket Apartments takes special requests – add in the next step! Haymarket Apartments accepts these cards and reserves the right to temporarily hold an amount prior to arrival. A refundable security deposit of GBP 100 is due prior to arrival. This will be refunded within 7 days of departure. There is a key code system for entry to the property and no manned reception. Details will be sent to guests prior to arrival. Guests found to have smoked in the proeprty will be charged a GBP 200 cleaning fee. Please inform Haymarket Apartments of your expected arrival time in advance. You can use the Special Requests box when booking, or contact the property directly using the contact details in your confirmation. We loved our stay here. Homely and comfortable in a great location. Unfortunately, the flat upstairs set the fire alarm off and there was a lack of communication around the matter; it also took a while for it to be switched off and resulted in us being late for dinner. However, this was no fault of the property. The location was fantastic with it being a short walk to Princes Street. Check-in and check-out were extremely easy (by just being sent a code) which was handy for a late check-in. The apartment was exceptionally clean and the bathroom was incredibly large! Beautiful building and very private. The party staying upstairs was very loud and hard to get to sleep then woke us up in the middle of the night! However this isn’t the hotel fault just maybe need to stress to the fact and to be conciderate of others when coming in from a night out! Room was spacious and a lot of light. Perfect for a weekend away. Complementary milk, tea and coffee nice little touch. The location is very convenient. It is very easy to get from the airport by using the AirLink bus. The bus stop is 2 minutes away walking. It is pretty close to the castle, Royal mile etc. The bed is very comfortable. The kitchen is equipped with everything that was needed. Everything; location, style and furnishings. Can’t fault it. The neighbour in no 4 did have music on which was loud and you could hear it when entering the main door downstairs. You could hear it throughout the landings but I am glad to say it wasn't as loud when I went into the room next door so it didn't bother me. This wasn't anything to do with the accommodation or host, just an inconsiderate guest. Windows are a little thin so you can hear outside. Not so good with workmen outside. But wouldn't stop me coming back. The location was great, the exterior/interior was superb. I wasn't sure where the building was exactly. but when walking towards the property before noticing the plaque, I thought "that's a nice building, would be fab if it was here" I was delighted it was. I loved everything about the apartment and the building. . Very spacious room, massive bathroom, everything you need for a nice break and only 15 minutes walk from the town. The prices were inflated which is normal for a rugby weekend. Some of the fold away beds weren't of the best quality. The location of this place was perfect for what we wanted. In between Murrayfeild & the town centre for nightlife. Exceptionally clean, warm and comfortable. Spacious room. Code entry made it super convenient. Host and hostess were exemplary in helpfulness and friendliness. Lack of parking and TV options was looking to put now TV stick into telly no socket below to plug in. Could do with a bigger bed, feel double is small for the size of the room. Fantastic location. Well appointed room with everything that you would need for a few nights away. Bright and cosy room.